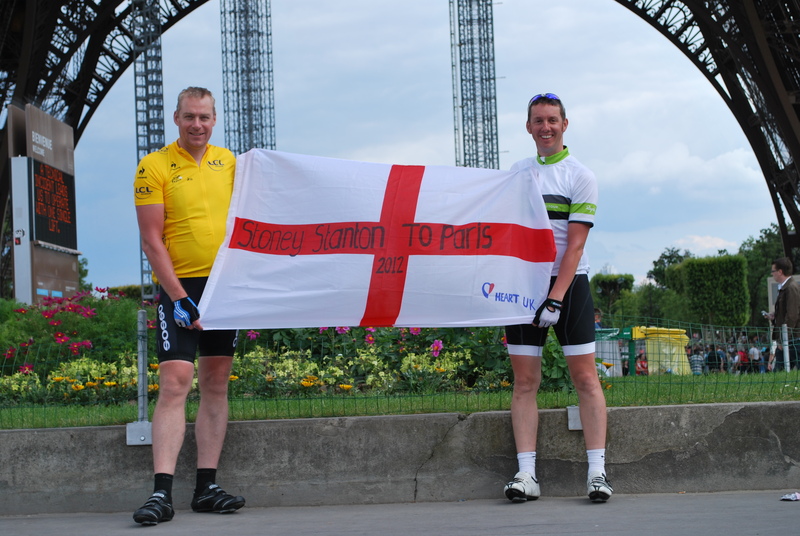 Stoney Stanton to Paris 2012 | Pedal Dad! It seems that each winter, my friend Stuey and I get our heads together and decide to make or summers more and more difficult. 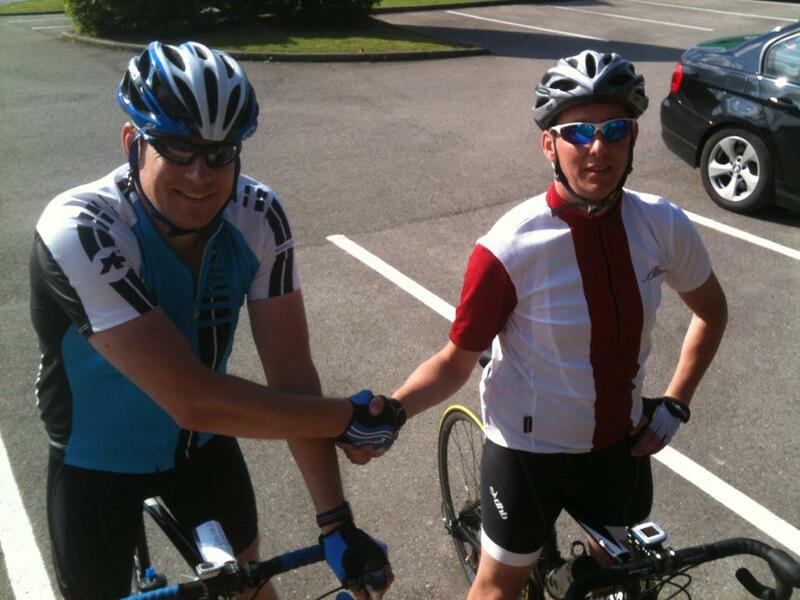 It started a couple of years ago when we decided that we’d ride to Skegness from our village in Leicestershire. The following year we decided that, along with our mate Dickie, we’d do one of the Tour of Britain stages. 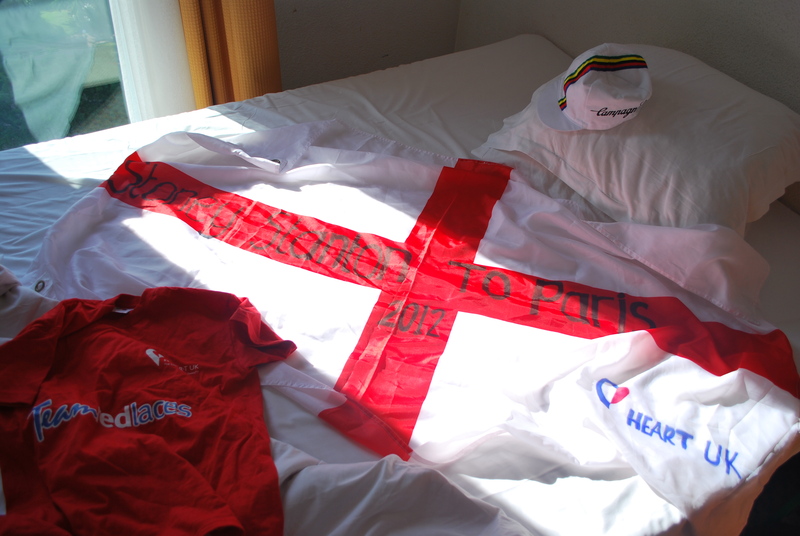 This year we topped everything that we’ve done before and decided to ride to Paris to see the end of the Tour de France. Planning the ride was good fun and a real motivator to help us stay on our bikes during the wet spring and summer months. In the end, we settled on doing about 100 miles a day for 4 days, with my wife and our friend Mr Tim supporting us along the way. Clare’s challenge began before ours with a trip down to Bognor Regis to drop off our two beautiful daughters at my Mums house for their holiday by the seaside. It is the first time we have left them anywhere for more than a night and the sadness I felt when saying goodbye to them made me question what we were doing (and it wouldn’t be the last time!). But by that time, there was no going back. My friends, family and colleagues had sponsored me nearly £1000 at that stage and one look at my Virgin Money Giving page reminded how important our ride had become. I never fail to be overwhelmed at how generous my friends and family can be. A few years ago they sponsored over £2000 when I ran the London marathon with Heart UK, so I told myself that £500 would be a fantastic sum to raise for this ride. Since the sponsorship pages opened I have been humbled and inspired by the support people have shown and I’ve been bought to tears on occasion when I’ve seen how generous some people have been. In a final push on Facebook the evening before we set off, we hit the £1000 mark which was just what I needed to get my mojo back after saying goodbye to the girls. My brother-in-law had set up an event on Facebook and invited people to come and cheer us on our way. So, at 8am on a grey morning on the cross roads in Stoney Stanton, stood a group of people all willing to be late for work to give us some final words of encouragement before we left. Despite a few niggling injuries, both Stuey and I were feeling reasonably confident about the ride. I was starting the ride about 16kg lighter than before I started training for last years challenge and Stueys dodgy back and knee hadn’t played up for at least a week or so! The murmurs from our friends were that 4 days was a long time to spend with each other and that some cross words would be inevitable. The smart money was on us falling out about directions but we shrugged that off because we were well equipped with a GPS device, a list of place names to head for and a plan to use familiar roads for at least the first 80 miles. After 3 miles we took our first wrong turning to great amusement and setting the tone for the rest of our trip! It was pretty much plain sailing for the first few hours; the rain had held off and our spirits were high at finally getting started. My mood was made even better when I heard Stuey let out a resigned little groan after making the schoolboy error of forgetting to unclip his shoes from his pedals and crashing on to the pavement in Northampton. Does that make me a bad friend? I’d like to think that if I made the same mistake, all my friends would find it just as amusing as I did! Anyway, no harm was done and after the assistance of a kind young lad, Stuey was back on his bike with no damage done. Being a “southerner” by birth meant that we were heading in to the territory where I had grown up, so after a quick stop I was looking forward to heading through Bedford and dropping in for a cuppa with my Nan. We’d done well to avoid the rain so far but it soon caught up with us, and by the time we arrived at my Nan’s we were both soaked. It was at my Nan’s house that we met up with Clare and Mr Tim for the first time. 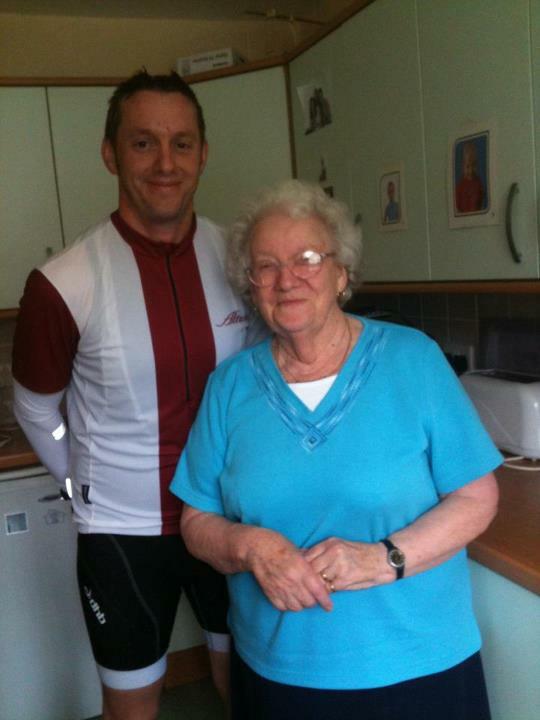 It was much to their amusement that my Nan insisted I should take off my damp cycling clothes so she could run them through the tumble dryer before setting off! A lovely idea, but I was only going to get wet as soon as I started cycling again to we hit the road again for a short hop to Baldock and lunch with my aunty and uncle. admired the hard work he put in to doing the best he could. I think it really resonates with me now that I’ve got kids of my own and want to make sure that I stay fit and healthy whilst acting as a good role model for them too. Anyway, after lunch the rain had slowed down and we had another 25 miles or so to go to Bishops Stortford. Both of us still felt pretty good, albeit a little damp, and we cruised through the Hertfordshire and Essex lanes before finding our hotel set in the peace and tranquility of the Stanstead flight path! Clare and Mr Tim were doing well, they’d checked in to the hotel and got the bags all sorted so that all Stuey and I had to do was saunter in to our rooms, grab a protein bar, have a shower and then drive in to Bishops Stortford to find a bite to eat. The first day had gone well and even though we both felt good after the ride, it was clear that both of us hit a wall of fatigue at about 9pm so it was an early night all round. This was the only day that we really felt that we were against the clock. The unknown entity of the Tilbury ferry stood between Essex and Kent, and we had to be in Dover by mid-afternoon to catch our boat to Calais. So it was a 7am start in a bright and fresh Essex summer morning. Leaving the bags for Clare and Mr Tim to load in to the car we set off at a steady pace to loosen up our legs from the day before. It was the first time that either of us had got back on the bike the day after riding 100 miles and after a little while we’d limbered up and started settling in to good pace. Navigation continued to be an area of weakness for me so we made a few short diversions before laughing to ourselves about the road sign for the “Secret Nuclear Bunker” on our approach in to Chipping Ongar. Well, we weren’t laughing for very long because coming through the town I picked up a puncture. We’ve been cycling for over 2 years, and I have never had a puncture on the road before. Fortunately, Stuey has had loads so when my pump clearly failed to be up to the task of pumping up a bike tyre, he was well equipped to help. A change of inner tube later we were nearly ready to head off again but a quick check of the tyre showed that it had a rip in it after I’d taken out the offending stone chip. This is where Clare and Mr Tim needed to come in to their own – a text message and picture were sent requesting a replacement whilst we headed onwards to the Thames with our fingers crossed that everything would hold up. Anxious that the tyre could fail on us, we picked up the pace and at one point kept up an insanely fast 30mph for about 5 miles. Our momentum was only slowed by another short diversion off (and quickly back on to) the main road! asking for (both Clare and Tim being complete bike novices meant that the concept of inner tube and tyre was new on them) and have the spares ready by the time we met up with them for refreshments before hopping on the short ferry trip across the Thames. We were definitely the subject of some interest on the ferry. There was a party of 40 pensioners going on the crossing giving us two lycra clad cyclists some funny looks. A couple of them asked for a lift on the handlebars and someone else asked if we were off to the Olympics, which I think was a complement? But again, we soon left all the banter behind and climbed up out of the Thames estuary and along the traffic light strewn A2 to meet up with the guys in a country lane near Faversham. stead, the break became 15 minutes of amusement at my expense after Clare and Tim had struggled to find Little Erisden with the we’d expected to and how luck we’d been to stay out of the rain so far that day. While demolishing some London 2012 branded shortbread, the conversation turned towards getting an earlier ferry because we were doing so well for time and now expected to be at Dover about 2 hours before we were due to sail. Agreeing to play it by ear and saying bye to Clare and Mr Tim we confidently set off for the final stage of the days riding. The rain soon caught up with us those and our plans all changed when we encountered a never-before-discovered mountain range! Someone had told us that Kent was hilly, but having ridden through a good portion of it by lunch time we thought it was no worse than anywhere else. But the slopes we encountered on that final section had us laughing out aloud with incredulity because they just kept going up hill steeper and steeper. I felt a little cheated at some points ecause the road surfaces were so wet and pitted that even the down hill bits were slow going. This was our first reality check of the ride and it really put in to perspective how hard this challenge could be. By the time we arrived in to Dover, the prospect of catching an earlier ferry had disappeared. 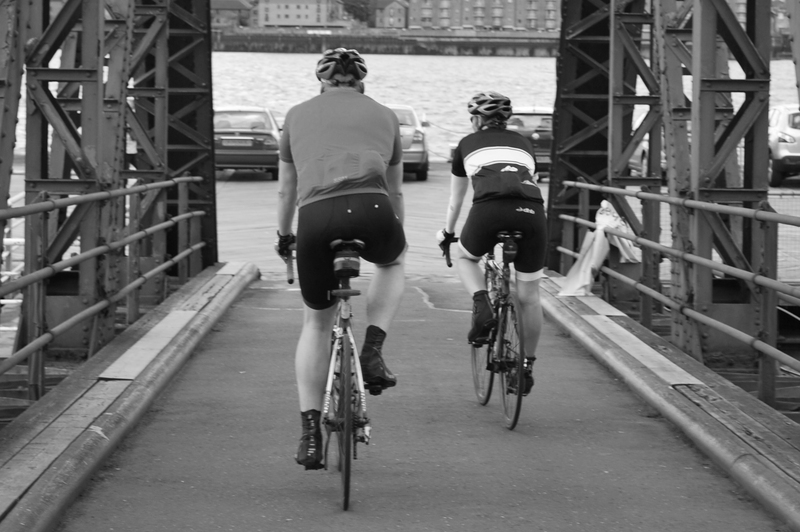 We’d kept a reasonable pace going through the hills but were both feeling the 200 miles of riding and looking forward to a beer on the ferry. As if the afternoon hadn’t already been difficult enough, with just a mile to go to the port, the GPS sent us off the main road with a left hand turn. Presuming that when planning the course I’d found a more direct or bike friendly route, we both swung left and were instantly met with a gruelling climb up to the castle at the top of the cliffs. I can’t explain why we didn’t turn round and follow the obviously more sensible road along the sea front, but with one last effort for the day (and a good few expletives) we got to the top and rolled down the other side in to the port and ready for our ferry journey. Stuey, Mr Tim and I enjoyed a well deserved beer on the boat. Me, Clare and Mr Tim all met when we worked in India together. We forged a strong friendship and shared some wonderful experiences whilst living in New Delhi. When Mr Tim found out that Clare had offered to drive my car and support us on the trip he didn’t hesitate in asking if he could come along too. It was a blessing that he was there to support all of us with some much needed camaraderie and his CSE French skills! I’d been worried about Clare getting lost en route in France, but with Mr Tim aboard I knew that whilst she’d probably still get lost, but they’d be fine and would enjoy the adventure. When we got back on dry land in Calais, we left Clare and Mr Tim with his Mums European satnav and jumped back on our bikes for a short tour around Calais to our hotel. I suggested to Stuey that it was probably a good way to “warm down” after the hilly end to the ride in Kent. A comment that was met with appropriate scepticism as the coastal winds whipped through our damp kit. After a comfortable stay in our cheap but friendly hotel we took a leisurely approach before setting off for the day. I put on my new tyre that Clare and Mr Tim purchased the day before and Stuey made a reasonable attempt at cleaning some of the grease off his grubby bike. As the riding began through Calais town centre, it was clear that my GPS device was beginning to struggle with some of the diversions and one way streets that I’d naively planned in to the course. After a frustrating 30 minutes we arrived back at the hotel for Clare and Mr Tim to guide us out of the maze called Calais and on to the course that we’d planned! At the time it didn’t matter to us that we’d added some unnecessary miles in to the ride because we were both feeling strong. But by the end of the day all that was to change. As soon as we picked up our route, our legs got warmed up by a mile long climb that just seemed to keep going and going. From that point on, I cannot remember a single flat bit of road throughout the entire day. In fact, so hard was the terrain that conversation slowed between us as we went in to ourselves to get up the climbs. One hill was so steep that I called out to Stuey “I’ve run out of gears!” he laughed and rode off telling me he’d got one left. It’s not for nothing that Stuey has picked up the nickname of “The Machine” when going up hills on his bike and throughout the day I would grow to appreciate the benefit of having a mate that could just keep going. Due to our delayed start, some more navigation “blips” and all those hills it was lunchtime before we made it to our first break. In stark contrast to the day before, after 50 miles our average pace was about 13 miles an hour. That is slower than Stuey and I have ever ridden and we tried in vain to explain to Clare and Mr Tim how big the hill was when we came out of a village called Lottinghen. While they couldn’t do much about the land we have to cover, Clare added more inspiration by unveiling the flag she had been working on for us. It was only a little thing, but felt of huge emotional significance at the time and made me remember the words that my Mum once used to describe Clare: “she finds a way to make everything special”. Pressing on in to the afternoon was now difficult. I had being suffering from stomach cramps for an hour or two and after lunch, every time I had a drink the cramps got worse and caused waves of nausea. I know enough about cycling to be aware that hydration is critical but the combination of stomach pain and fatigue began to get a grip and the early afternoon stage of the day was the toughest 30 miles I have ever cycled through. By the time we reached our final break of the day my spirits were lower than at any other point on the ride. As usual Clare and Tim did their best to cheer us up but I think it was clear to them that we were reaching our limits. Emotions were running high and I could see that Clare was upset by my condition. I tried to put on a brave face but she could tell there was something wrong when I was off my food – that never happens! With a promise from Mr Tim that he’d not seen any more hills, we kicked on for the final push of the day. 200 yards in to the next section, the road started going up hill again and Mr Tims name was mud! We placed sole responsibility for another mile long climb with him, but soon it was time for my route planning skills to take the blame for another erroneous turning on to a tractor track. As we made it back on to the planned road, sending out the search party! With all the diversions we took, we’d cycled nearly 110 miles and all resolved to enjoy a couple of lagers to “help rehydrate” before showering and getting changed. Strangely, they were the first things I’d been able to drink for 8 hours without causing stomach cramps. The plan for Friday evening had been to head in to Amiens for a meal, but we were all shattered so we crossed the road on the retail park and went for our strangest meal of the trip. Obviously tiredness makes you less observant, so all of us failed notice the big potato shaped logo of the restaurant we walked in to. And we barely raised an eyebrow when told that they didn’t serve chips with the burgers that Mr Tim and I ordered. As it turns out, the place we were eating was a jacket potato themed diner. The burger came with all the trimmings but strictly no carbs other than jacket potato (or one and a half jacket potatoes to be precise). Nonetheless, I gave it a good stab and we all watched on in awe as The Machine decimated his way through every morsel on his plate in one of the most impressive displays of the day! I crept in to bed that night next to Clare who was already asleep and drained from the days events. As I looked over, I thought to myself how lucky I am to have a wife who was prepared to give so much time, effort and emotional energy in to helping me achieve this epic challenge. I know what a wrench it had been for her to leave the girls and vowed to repay her dedication any way I can. Throughout the trip Clare’s compassion, humour and enthusiasm made the difference to me and it struck me that very few other blokes would be so delighted to have their Mrs along with them on a road trip like this. The Campanile in Glisy goes down as my favourite hotel of the journey. The hospitality was great, the room was perfect and the location ideal but we didn’t have any time to hang around in the morning because we wanted to get to Paris as soon as possible. Sporting our best cycling jerseys (white and green Rapha top for me and a Tour de France yellow jersey for Stu) we set of at a high cadence and steady pace hoping for a more forgiving ride than the day before. After the tribulations of Friday I had decided that I was fully prepared to arrive in Paris with nothing left in the tank because I wanted to be proud of the way that we had attacked the course. A few miles in to the day, my legs eased up and I felt stronger and more energetic than at any point the day before. I wondered if I’d experienced what the Tour riders call “just a bad day” and that, finally, the months of training and my improved fitness were going to pay dividends? The route began with a few moderate climbs and seemed to flatten out on to a long straight road with corn fields one side and corn-on-the-cob fields the other. The clouds hung low and at times they eclipsed the top of the wind turbines that sporadically broke up the landscape. It was another day where the road surface left a lot to be desired but, for the main part, it was flat and we were going at a steady pace of 16-17 mph. After we pulled off the main road, we passed through little traditional hamlets and villages such as Hardvilliers and Lafraye before arriving to a small crossroads where we’d planned to meet Clare and Mr Tim for some snacks and refreshments. Having been so reliable, I was surprised that I couldn’t immediately see the welcoming sight of the black BMW with the spare red Bianchi on top. We pulled over to give Clare a call and that was when my stomach dropped. As I put my hand in my packet to grab my phone, I felt something that shouldn’t be there. The car keys. I’d unlocked my car in the morning to put a bit of air in my tyres and obviously popped the keys in to my back pocket. We’d gone 35 miles and I couldn’t imagine cycling back to the hotel and then starting again. Even cycling back to Glisy and then driving back to Fouquerolles would add miles on to the ride. I began to panic. Looking at my phone I saw 31 missed calls from Clare and the mobile phone operator. It’d been on silent all morning and Clare had clearly been trying to get hold of me for 2 hours since we’d set off. I dreaded making the call because I knew how Clare must be feeling. In keeping with the rest of the week, Clare and Tim had been resourceful again. They had taxi on its way and were waiting our call to confirm where we were. Clearly, because my car was still unlocked, only one of them could come to get the keys. So Clare waited behind while Mr Tim accompanied by Championship Manager on his iPad, a non-English speaking taxi driver and his wife made their way to us with all the remaining snack food for us to carry to Paris. Once Mr Tim grabbed the keys and dropped off the food we were on our own for the rest of the way and our support team were up against it to try and get to the Eiffel Tower to meet us as we finished. As the culprit of this situation I have taken a bit of stick, but the way this problem was solved is a credit to the spirit of everyone on the trip. It is during the tough times that you find out what you’re made of, and it is clear to me that our little team was made of strong stuff. Buoyed by the way a potentially disastrous situation had been resolved, we jumped back on the bikes with our pockets stuffed with as much food as we could carry and set off once again for Paris. We’d had an hours delay and the mounting heat wasn’t making things easy. Stuey had got burnt by the sun the previous day and we were constantly on the look out for a rural pharmacy. We’d reviewed the days route the night before and knew that at around 50 miles there was the final big hill of the ride. After a short sharp climb at about 46 miles I was getting ready for the final big push when we stopped at a pharmacy for sun cream. It was closed but I looked at my GPS and saw that we’d covered just over 50 miles. Hopefully, I said to Stuey that we must have misinterpreted the elevation profile and must have done all the climbing. Unfortunately, I had forgotten to account for a couple of minor navigation issues that had added a few miles on to the mornings activities and as we rounded the next corner we were greeted by the final big-boy of the whole adventure. It was a good one, but we went up it together at a good pace and at the top we pulled side by side and congratulated each other at passing the final stern test of the day and resolved to enjoy the remaining 45 miles. The roads began to lead to towns rather than villages and were mainly flat or downhill for about 10 miles so everything started to feel easy. As we rolled downhill in to one small town I got that swimming feeling from my back wheel and it was clear that I had punctured again. As I was fixing it, a group of 7 or 8 riders went by dressed in Team Sky tops greeting us and offering support. They had numbers on their bikes and I felt encouraged that we might do some of the remaining miles with a bit of company (or some pace makers) to break up the 30 miles we’d got left. A little further on, we saw another group of Sky riders at some traffic lights. After my GPS route tried sending us down another one-way street we lost them, only to bump in to them again as we vainly attempted to relocate our route. After that last diversion, we assumed that they must be going to Paris too so began following their arrows. Stuey had pulled us up to the back of their little group as we passed over another big river that they seem to have a lot of in France. By this stage, I got a sinking feeling each time we passed by a river (pardon the pun). I’d learnt that when we were cycling away from a river, this was invariably accompanied by a hill. And this one was no exception. This one was a hill with a capital H. And a capital I!! The road started to kick up and we sailed past some of the Sky riders before settling in to a decent rhythm and a brisk pace. The road cut its way through woods on both sides which gave a respite from the sunshine, but obscured the road after the continual twists and turns. I don’t know if that was a good thing or bad. If I’d have seen how long the hill was at the start I might have been disheartened earlier, but every corner bought hope that the climb was finished, only for those hopes to be dashed as the road continued to go upwards. Eventually the road flattened out and we waved goodbye to the Sky riders who had a feed station on the descent. The climb had given us time to recognise the blue arrows on the road and attached to trees and sign posts which we were now following because my GPS showed we were nearly 3 miles off course from the route I’d planned. Pushing on and following the blue arrows, we rolled on through villages and towns, stopping only for Stuey to finally pick up some sun cream, before reaching the outskirts of Paris. With the entry to Paris came traffic lights, roundabouts and cars in numbers we’d not seen on the whole trip. These all made our progress slow until we hit the banks of the Seine and got some clear air to raise the pace again. We passed by a couple of fellas cycling for the Action Medical research charity but by this time I was becoming more and more impatient for a glimpse of the Eiffel Tower. Having been to Paris a few times I thought I knew my way around but the blue arrows continued to be a God send to help navigate the new roads. As we approached the La Defense area where our hotel was located, I felt encouraged again, knowing that we didn’t have far to go. an following my instincts to roll down the Champs Elysee to the Arc de Triomphe, we followed the blue arrows through inner city roads. The traffic was not too heavy, but when we encountered a roundabout we were both completely thrown. Based on the view that acting with confidence was the best way forward, I employed a series of hand signals to gesticulate to drivers what I was doing and what I needed them to do. Somehow, amid this confusion we kept on track and resumed on our way through Paris. Suddenly, when I looked up, I could see the Eiffel Tower looming behind the busy shops and apartments. We headed over the Seine and drew in to a side street. I knew that Clare and Mr Tim were trying desperately to get to see us finish so we took a moment to get off the bikes, grabbed a beer in a lovely little bar and reflected on how far we had travelled. giggle with us, but as soon as I got the call from Clare we jumped back on the bikes and whizzed around to the base of the Tower. 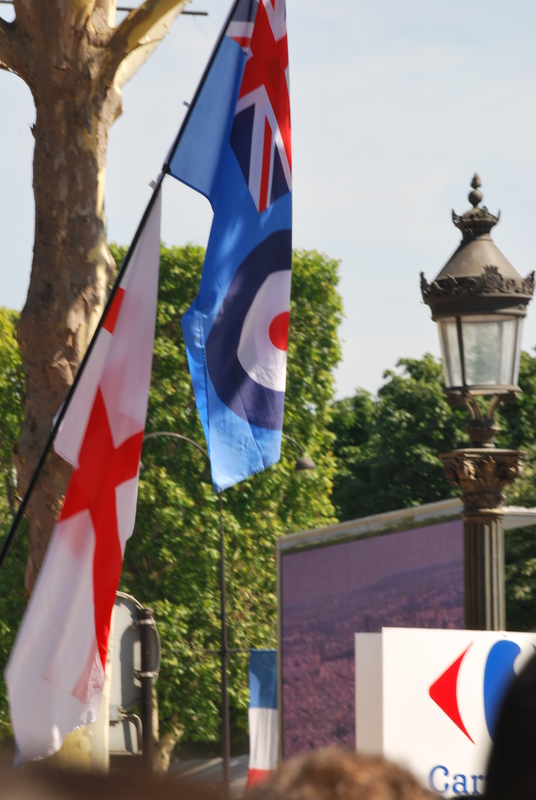 When we spotted them, I could see that Clare had secured the flag she’d decorated to the railings and there was no way we could miss them. The handshakes, hugs and kisses that we shared happened amidst a mixture of emotions. Relief was probably the strongest one straight way. Relief at not having to ride the bike much more, of having arrived safely and of seeing Clare after the tough day she’d had. I think a sense of camaraderie came next. Knowing that we had achieved something really significant in our lives and that we had all done it together; with everyone overcoming challenges every day to get where we were now standing, sharing a bottle of champagne. And a sense of achievement began to slowly grow. Groaning with the effort of climbing more steps, we emerged to the sunshine outside of the Champs Elysee Metro station to see that Le Tour had come to town. 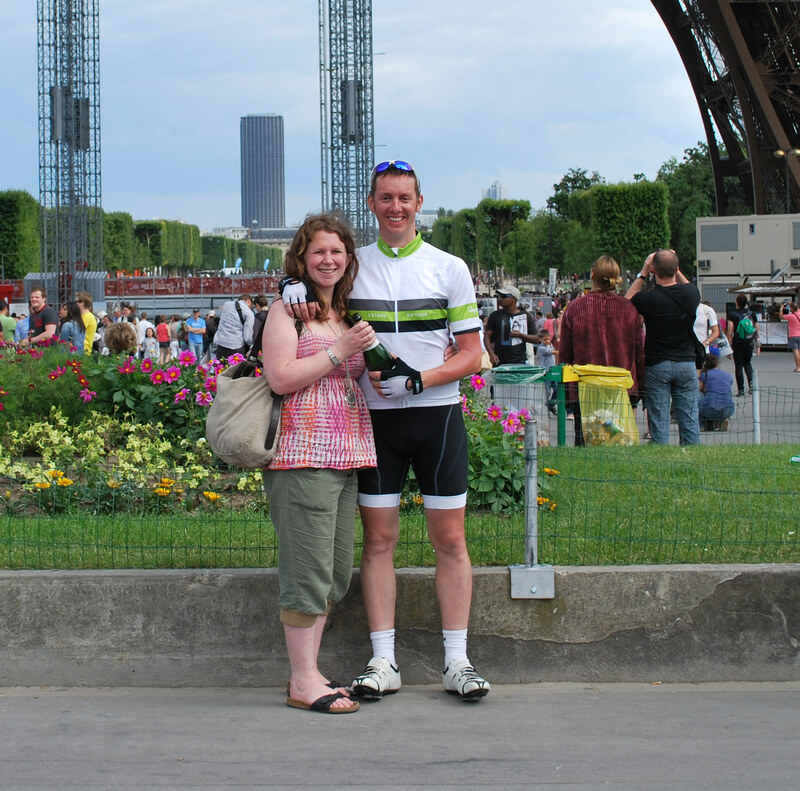 The previous evening, Stuey and I had cycled a few miles around Paris and up the Champs Elysee to our hotel. 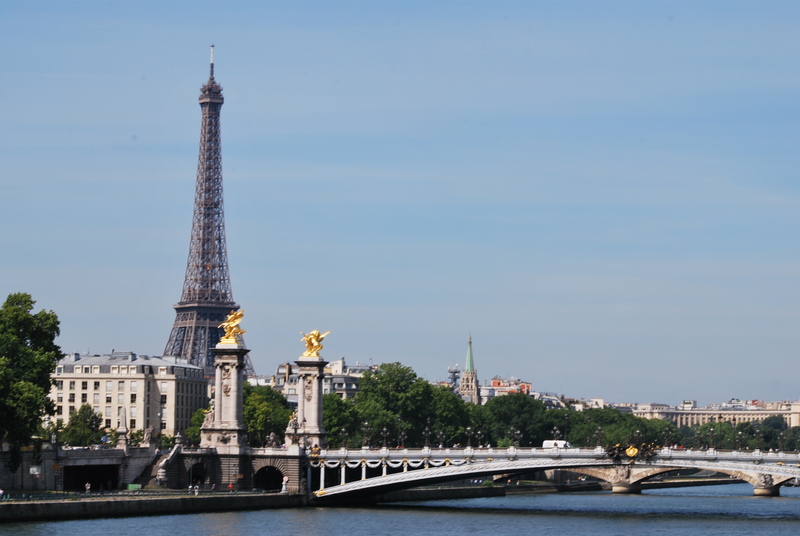 We’d continued to use confidence and hand signals to negotiate our way up the road and had been enthralled by the hustle and bustle of the busy boulevard at the heart of Paris. But this morning the road was empty. Railings separated the gathering crowds already two deep in places, from the deserted cobbles. The weather had decided to celebrate the first British winner of the Tour de France with us and we were in for a real treat of a day. A leisurely walk around the city led us to a delightful little restaurant for lunch where we bade adieu to Clare and Mr Tim for a few hours once again. Following the diversions around the high end fashion boutiques and the Government buildings, we finally made it back to the Champs Elysee to find a spot to watch the riders come home. On the big screen we could see the peleton making its progress to the city and suddenly the race came to life as the Tour riders entered the most famous circuit in cycling. The atmosphere was like nothing I have ever experienced before. 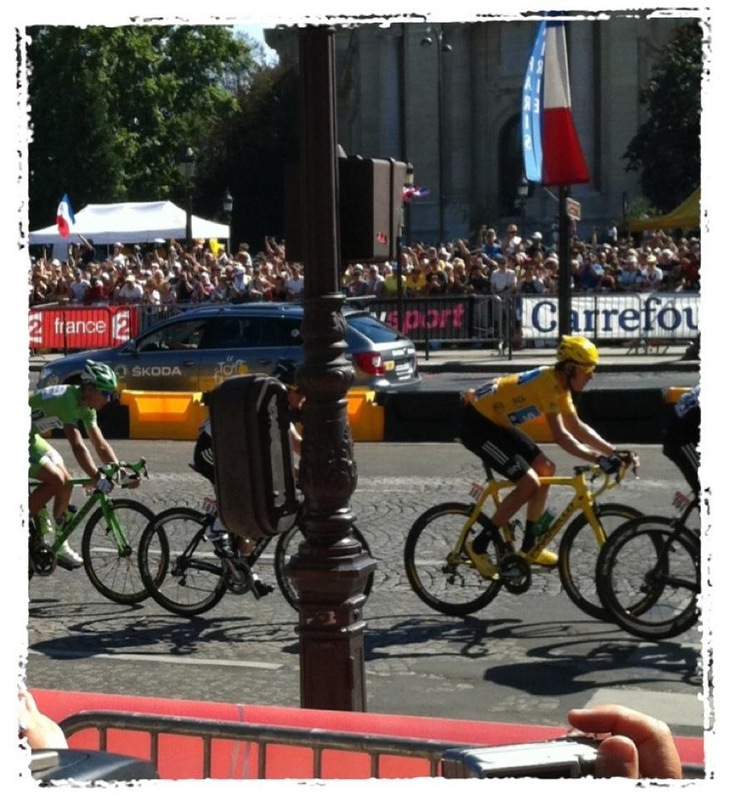 A buzz of excitement at seeing and Wiggins win the Tour was combined with the air of expectation to see Cavendish again win a sprint in Paris. The crowd were being bought to fever pitch by the exuberant French commentator crying out over the PA system. It didn’t matter to the thousands of Brits that the commentary was all in French. We could see the break away hanging out at up to 30 seconds and collectively willing Team Sky to bring it all back together to lead out Cav. Mr Tim and headed off to celebrate with a couple of beers. We went on to enjoy one more evening in Paris before setting off home to pick up our girls and settle back in to the British summer. My sense of achievement keeps growing as does my gratitude for the team work and support we gave each other and my respect for the generosity, kindness and love that I received to help me finish a remarkable little journey on a bike. 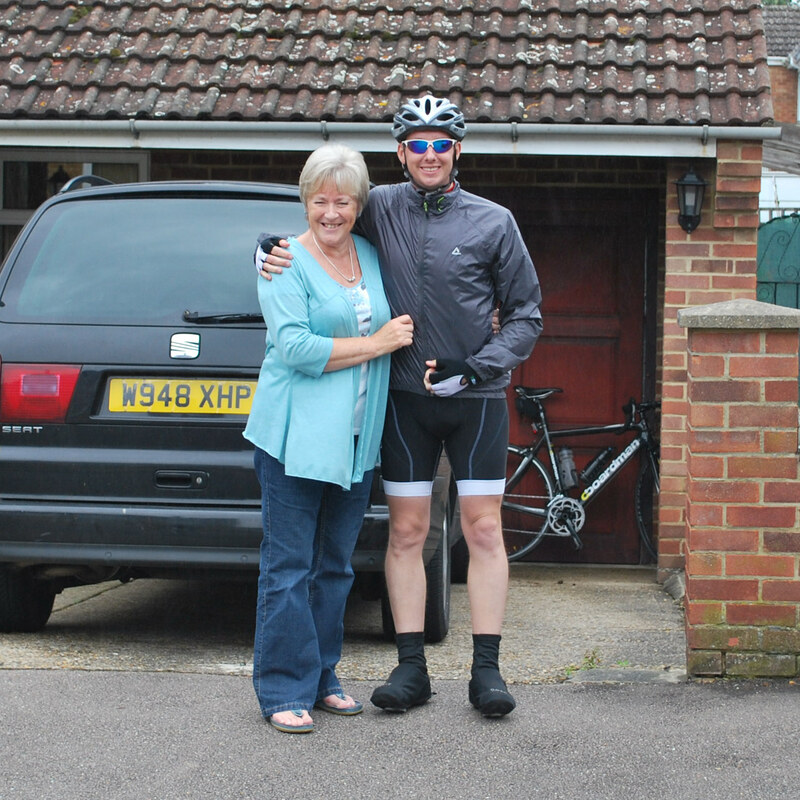 Pingback: Last years Big French Bike Ride… | Pedal Dad! Pingback: I had my mojo, lost my mojo and then found it again! | Pedal Dad!